Kartik and Naira spend some time together. Rajshri looks for them. She has lied to Devyaani. Manish and Akhilesh learn that Kartik has gone out for kids’ project work. Suwarna worries for Kartik and demands them to get him home. Kartik and Naira romance and want to live and die together. Kartik tells her that they should tell the family about their togetherness and make everyone happy. He feels everyone will be happy knowing about their re-union. Naira also feels the same. Kartik and Naira get caught by Rajshri. They happily tell their good news, that they have decided to reunite. They realize their mistake of taking divorce. They tell Rajshri that they have patched up forever. Rajshri gets happy for them, but finds it difficult to explain them the fire consequences of re-uniting. 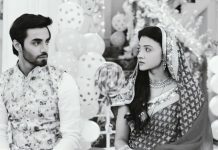 She separates Kartik and Naira with a heavy heart. She asks them to realize that their decisions are hurting the families again and again. Kartik tells Rajshri that they got late to realize this, but their decision is right now. Naira doesn’t want to be more late. They both sound very much sure. They don’t want to live without each other. Rajshri tells them that Goenkas and Singhanias will not accept their reuniting decision, the families will have a big clash because of them. She does her duty and explains them that reunion isn’t so easy. Naira tells her that the families will be happy to see them together. Rajshri tells her that situation has changed now, the families have lost love and respect between each other, there is much anger and tension because of their divorce. She asks them to follow Naksh’s advice and forget everything. 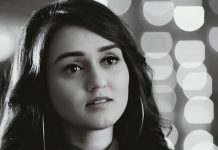 She wants Kartik and Naira to stay away. She asks them to give some time to families so that they don’t feel cheated. Rajshri tells them that she isn’t against their decision, she understands them well but she is scared of ruining the happiness of the family. Kartik and Naira don’t want to change their decision. They stick to their decision. Rajshri comes home and lies to the family about Naira. She doesn’t reveal that Naira went to meet Kartik. She wishes Kartik and Naira understand her. Kartik drops Naira home, and returns to Goenka house. He finds Suwarna and family worrying for him. Everyone tells him that they were worried for him. He apologizes to them. Dadi wishes Kartik gets happiness. Kartik doesn’t want to give shock to anyone. He is sure that everything will get fine since Naira is with him now. Akhilesh convinces Manish for funding his dream project. Kartik hides from all the family members and makes a quick leave from the house. Naira stays lost in his memories and gets happiness after a long time. She gets a wonderful surprise when Kartik visits her. He tells her that he was missing her too, and couldn’t sleep. She tells him that they should find some way to convince the families. He tells her that they should be true to each other and families too. He doesn’t want her to go away. They romance on old hindi songs and dance. He celebrate their belated reunion. She tells him that its tough for her as well to send him away. She sleeps and on waking up, she realizes that Kartik didn’t leave and is still around. He tells her that he couldn’t go home, he can’t live without her since they united. Dadi and Suwarna miss to find Kartik’s absence at home. Kartik and Naira’s filmi romance continues. Naira hides him in the cupboard when Devyaani comes to wake her up. Devyaani looks for her diary. Naira manages to stop Devyaani from checking the cupboard. Kartik gets locked in the cupboard. Manish realizes Kartik isn’t at home. He wonders where did Kartik go and why.